SR374 dead ends at US33 in the North and SR56 in the South. I normally get on from SR56 and drive North until it ends on US33. Most of SR-374 is tree lined and surrounded by hills. Much of the road runs through Hocking Hills. The road is very curvy and hilly. The road is a blast to drive and it is very rare that I have had to deal with traffic. On the couple of occasions where I came upon a car they have been kind enough to wave me by since the passing zones are few and far between. Update contributed by OHwing16 in Dec 2012: This route is a beautiful ride through the state forest. It can be amazing in the fall, but summer and spring are good as well. Most of the road is well paved. Watch for a small amount of stones and possibly leaves/branches from the trees that overhang much of the road. SR374 is very hilly and twisty. There are a number of very tight corners, but they are well marked. And when they say 15mph they mean it. I was down in first gear with my peg scrapping doing 20mph in a couple of them. I have encounter very little traffic on it but since it runs through Hocking Hills park during the weekends the small section where SR374 merges with SR664 can be busy with cars and RV's. Update contributed by OHwing16 in Dec 2012: Rollercoaster is the best description. Lots of tight turns and sweepers with continuous elevation changes. Surface quality is good with few flaws. 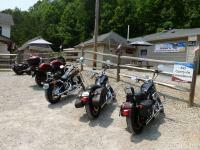 You ride past Hocking Hills State Park when SR374 merges with SR664. Other than that there is nothing but hills and curves. SR374 does not run through any towns. Update contributed by OHwing16 in Dec 2012: Not much in the way of food or fuel along the way. South Bloomingville on the south end and Rockbridge are you best bets. Hocking Hills is is spread over multiple locations, all of which can be found along this road. Ash Cave and Conkles Hollow are easy hikes on concrete paths to interesting geological features and waterfalls. Rock House is a large cave-like structure you can explore, while the Cantwell Cliffs is the largest and most strenuous area to visit. on September 7, 2013 1 out of 1 members found this review useful. GREAT ride!! Just watch out for gravel. And yes, hit Jimbo's! HUGE burgers, cold beer. on June 13, 2012 1 out of 1 members found this review useful. Was directed here by a couple in Indiana at a bar while my girlfriend and I were riding through, excellent choice! Beautiful roads, plenty shade(rare in most Ohio) and definetly do stop and stretch your legs and explore the Recess Caves and gorges in the park. Short hikes and refreshing cool air. on December 21, 2011 1 out of 1 members found this review useful. great review by MCR, be sure to stop at jimbo's on 56 near the start of 374 for lunch, big burgers and tons of great vintage motorcycle hill climbing photos and trophies won by the owner (jimbo). the whole area has tons of beautiful twisty roads to explore. i rode it in late october and can't wait for a break in the weather ot go back! on April 12, 2015 0 out of 0 members found this review useful. I just rode this one for the first time today. What a tremendous, scenic road. I loved the curves and hills. Best road I've ridden in a long time. Very fun ride! A little more car traffic than expected, but not too bad for a saturday. Watch for pedestrians walking along the side of the road. Loose gravel in a couple areas. Well worth the trip. Can't wait to get back down there and ride it again. on June 13, 2012 0 out of 0 members found this review useful. And it's a MUST to hit Jimbo's for some refreshment and friends but I recommend Millstone BBQ just north of Hocking SF for grub! !